The Vadrasana series is regarded as the king of all asanas related with the mind. Vajrasana is the Sanskrit word for thunderbolt, and rightly so, just like a thunderbolt these postures have a powerful influence on the senses. Within the body there are thousands of channels. These channels, commonly known as nadis or meridians, allow energy to flow. The major nadi governing the genital and urinary system is called the Vajra nadi. In this series the Vajra nadi is regulated and sexual energy in the body balanced. This group is very beneficial for the reproductive and digestive system and relieves one from pelvic strain, waist pain and indigestion. During the Vajrasana series the flow of energy is directed from mooladhara chakra up to sahasrara chakra. Not only does this help for meditation, it also transfers sensual energy toward spiritual upliftment; bringing our minds out of individual passions and desires to the greater good of all. 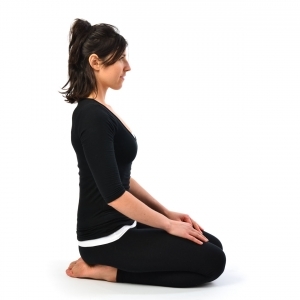 Sit in Thunderbolt pose (Vajrasana). Slowly bend back, taking the support of the body onto the right elbow and arm and then the left. Lower the top of the head to the floor and arch the back. Once balanced in the position rest the hands on the thighs. Try to keep the knees in contact with the floor. If necessary, separate the knees. Ensure there is no strain. Remain in the position for as long as comfortable then engage the core muscles and gracefully exit, by reversing the movements and returning to Thunderbolt pose (Vajrasana). Stand up on the knees and separate the knees slightly apart so that they are in line with the hips. Keep the feet flat behind the knees. Stretch the arms out to the sides, shoulder height. Lean backward, slowly reaching the right hand to the right heel and the left hand to the left heel. Push the hips forward and the thighs vertical. Actively lift the chest and bend the spine backward. Carefully release the head to a relaxed position. Push the palms down and use the arms to anchor the shoulder blades onto the back. Remain in the position for as long as comfortable then engage the core muscles and gracefully exit, by reversing the movements. Practice up to 3 rounds. Or hold the position for up to 3 minutes. Stretch the arms out to the sides at shoulder height. Twist to the right and reach the right hand to hold the right heel. Simultaneously, stretch the left arm in front of the head so that the hand is at eyebrow level. Gaze towards the left hand. Push the hips forward and keep the thighs vertical. Hold for a few seconds then engage the core muscles and gracefully exit by reversing the movements. Lower the arms to the sides of the body and repeat to the left. Place the arms beside the body. Take a big step forward with the right leg and plant the right foot firmly on the floor. Have the thigh is horizontal and the ankle in front of the knee. Lunge forward and transfer the weight onto the right foot. Ensure the right knee is in line with the ankle. Bend forward and lower fingertips to the floor. Gently arch the back, raise the head slightly and hold the position. To release, shift the body weight to centre between the right foot and left knee. Continue the forward and backward lunge on this side up to 10 times. Once complete, stand on both knees then return to Thunderbolt pose (Vajrasana). Practice the same amount of rounds to the other. Take a hold of the lower calves with the thumbs uppermost. Slowly bend forward and place the crown of the head on the floor in front of the knees. Raise the buttocks until the thighs are as vertical as appropriate and gently press the chin against the chest. Hold the position for up to 20 seconds. Lower the buttocks to the heels to assume Child’s Pose (Shashankasana). When ready raise the torso upright and return to Thunderbolt pose (Vajrasana). Practice up to 5 times. Lower the hips back so the buttocks rests on the heels. Keep the hands on the floor, the arms straight and rest the forehead on the floor in front of the knees. Assuming the Held Child’s Pose (Shashankasana). Without moving the position of the hands, slide the chest forward to just above the floor until it is in line with the hands. Have the elbows in close to the body. 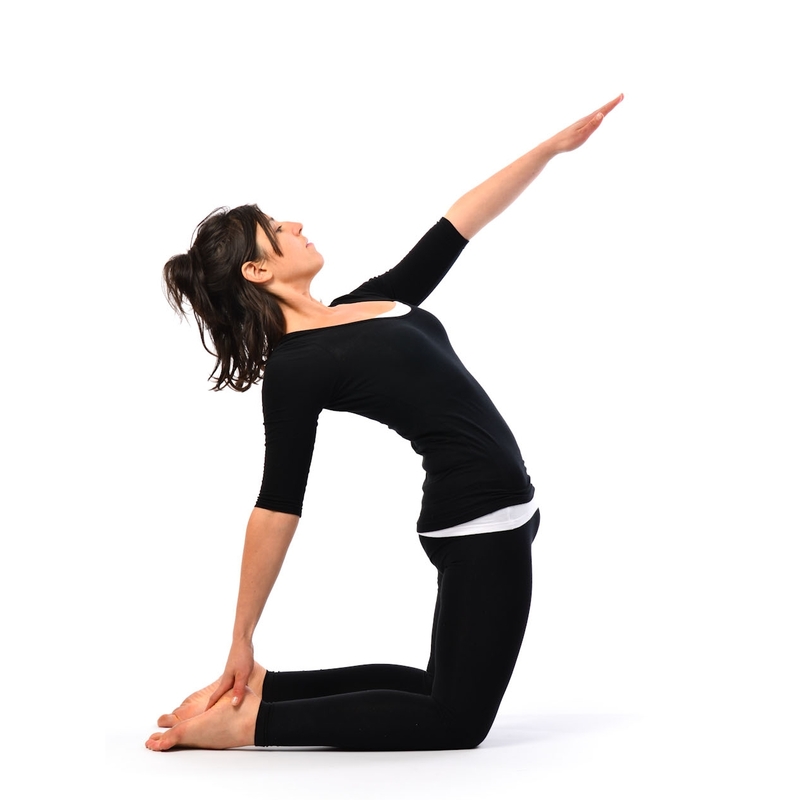 Move the chest further forward and then upward, straighten the arms and lower the pelvis to the floor. Assuming the Cobra Pose (Bhujangasana). Ideally the nose and chest brush the surface of the floor as the body moves forward. Have the back arched, chest open and head raised. Hold for a few seconds then slowly raise the buttockes and move the body backwards, keeping the arms straight, returning to Child’s Pose (Shashankasana). Practice up to 7 rounds. Lower the hips back so the buttocks rest on the heels. Keep the hands on the floor, arms straight and rest the forehead on the floor in front of the knees. If possible, the arms and forehead touch the floor. If not, make two fists and place one vertically on top of the other to support the forehead. Another modification is to cup the chin in the palms of the hands with the elbows resting on the floor. Soften the body and fully relax. Straighten the arms and raise them above the head, shoulder width apart. Keeping the arms and head straight, in line with the torso, bend the torso forward from the hips. Lower the hands and forehead to the floor in front of the knees. Hold for a few seconds then engage the core muscles and slowly raise the arms, head and torso upright. Raise the head and lower the spine to concave the middle back. Simultaneously lift the tailbone, straighten the right leg behind the body, bend the right knee and stretch the toes towards the head. Expand the abdomen, open the chest, fill the lungs and stretch the whole front body. Hold for a few seconds then straighten the right leg, draw the knee in towards the chest, lower the head and round the spine upwards. Simultaneously tuck the tailbone under the hips and draw the belly button towards the spine. Practice up to 5 times with the right leg, then up to 5 times with the left leg. Hold for a few seconds the lower the head and arch the back drawing the belly button towards the spine. Simultaneously tuck the tailbone under the hips. Contract the abdomen releasing all the oxygen. Practice 5-10 upwards and downwards movements. Raise the buttocks and stand on the knees. Lean forward and place the hands flat on the floor beneath the shoulders with the fingers facing forward. Have the hands in line with the knees, so that the arms and thighs are perpendicular to the floor. Separate the knees so that they are under the hips. Raise the right knee and place the right foot flat on the floor beside the inside of the left knee. Put the right elbow on the right knee and rest the chin on the palm of the right hand. Rest the left palm on the left knee. Close the eyes and relax. Keep the body still and the spine and head straight. Hold for some time then release the pose and relax the knees. Practice for the same duration to the other side. Sit in Lion Pose (Simhasana). Open the eyes and gaze at the eyebrow centre, adopting shambhavi mudra. Open the mouth and extend the tongue out as far as possible towards the chin. Produce a clear, steady ‘aaah’ sound, keeping the mouth wide open. Fully expressive with no strain. Once breath has been exhaled completely, close the mouth and relax the jaw. Separate the knees about 45cm apart and keep the toes in contact with each other. 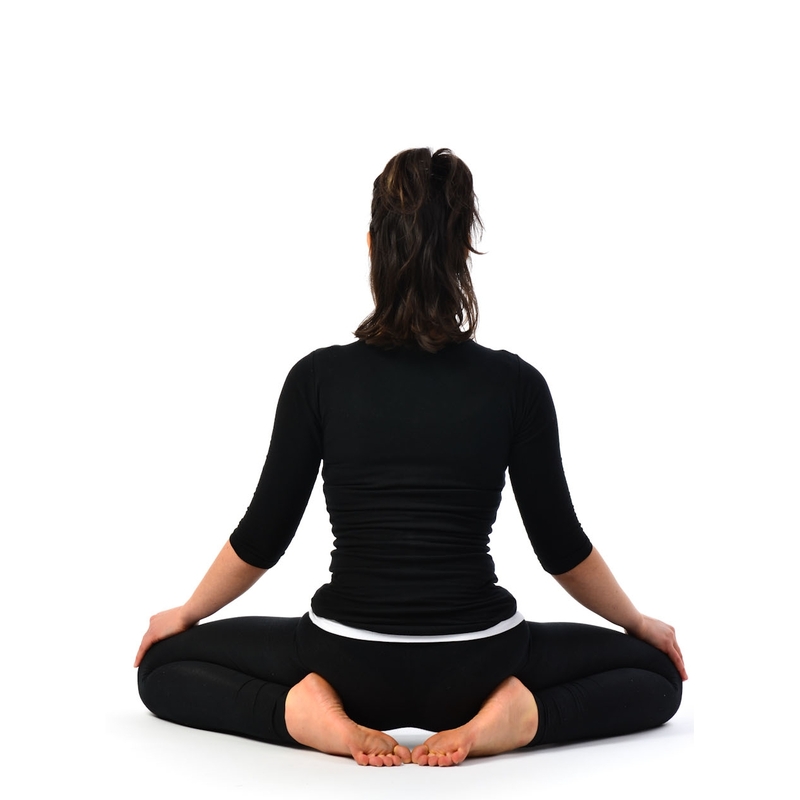 Lean forward and place the palms of the hands on the floor between the knees, fingertips pointing towards the body. Arch the back slightly and lean the upper body’s weight on the hands. Lift the chin and place a comfortable amount of tension in the neck. Close the eyes and focus the inner gaze at the eyebrow centre to perform shambhavi mudra. Close the eyes and relax the whole body. Separate the knees as far as possible, while keeping the toes in contact with the floor. Separate the feet slightly to allow the buttocks to rest on the floor between the feet. Place the hands on the knees, palms turned down. Ensure the head, neck and back are upright and straight. Cross the arms in front of the chest, place the hands under the opposite armpits and have the thumbs pointing up. Place the palms on top of the heels, fingers pointing towards each other (if uncomfortable, place the palms just above the heels). Kneel on the floor with the knees close together. Bring the big toes together and separate the heels. Lower the buttocks onto the inside surface of the feet, heels touching the inside of the hips. Rest the hands on the knees and turn the palms down.